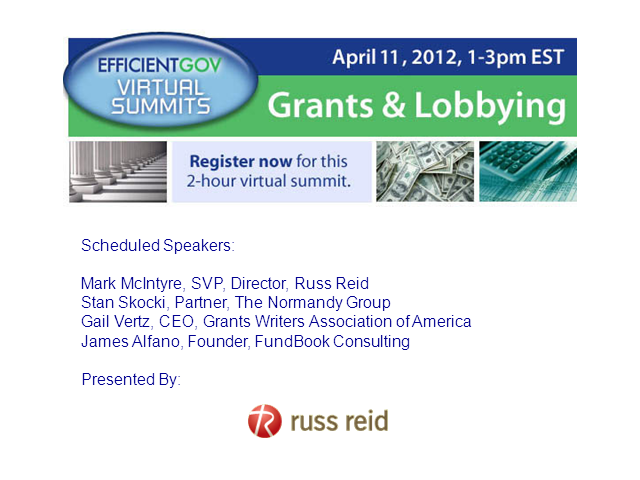 This two-hour event will offer various perspectives on how to utilize lobbyists and obtain grants in the age of no earmarks. Attend this webinar to learn how Kitsap County is achieving digital communications excellence with several initiatives, including KENS - short for Kitsap County Electronic Notification System. Learn about their digital communications strategies, implementation of key tools - such as social media - and blending of traditional and innovative marketing methods to increase their communications reach. Taking the pulse of your constituents and finding ways to communicate with them directly is not easy. Join EfficientGov, Grant Communications and Votifi in this 45-minute webcast discussing new options for enhancing communication with your constituents. Grant Communications specializes in enabling municipalities to deliver messages (about school systems, ecoonomic development, etc.) directly to the public. Getting your message through to voters and taxpayers is not easy. Grant will provide a brief case study on its work with communities large and small. Votifi is an online polling company providing constituents with the opportunity to communicate through a "polling widget." AP Wireless Infrastructure Partners (APWIP) provides expertise in reducing the risk associated with managing cell sites. Whether turning existing leases into cash for immediate use, increasing site revenue, or, helping to manage cell carrier relationships, APWIP brings years of expertise to your municipality. Listen in as Orange Village, Ohio's lead counsel talks about the details of why Orange Village chose AP Wireless to manage its tower business resulting in a $231,000 lump sum check to the municipality. Learn how monetizing cell site rents protects the municipality from the risks of contract termination, rent reduction, and technology changes. Hear why other cities have decided to monetize their cell sites. Understand the different transaction structures that are available to you and how to evaluate cell site lease buyout offers. AP Wireless will share all of this, along with their perspective on the wireless industry and its ongoing evolution in this one-hour webinar. This Free webcast will offer you insight and advice into generating a competitive application for the $526 million third round of the US Department of Transportation's TIGER grant. Bill Hanka, lead partner for the Ferguson Group's transportation policy practice group and Dr. Beverly Browning of eCivis will walk you through the TIGER grant opportunity. RFx enables municipalities to leverage their purchasing power to negotiate better rates with legal service providers. We help legal departments automate the RFP process and bid out work opportunities. Through a more competitive process, legal departments can achieve savings of 15% - 40% on legal services. This 60-minute webcast will demonstrate the RFx Legal solutions and process. EV charging stations are being deployed in cities across the US. Thanks to grants from the US Department of Energy, municipalities have the opportunity to receive infrastructure and technology from multiple companies at no cost. Listen to Richard Lowenthal, Founder and CTO of Coulomb Technologies discuss his company's ChargePoint EV charging station, the role it can play in your municipality and how it is amping up the nation's EV movement. In today's tight budget environment, cities and towns need every dollar. Corporate Sponsorship represents a unique opportunity to reach out to public and private corporations locally and nationally for sponsorship of town events and services, such as parks & recreation, facilities, education, and much more. In this 30 minute webcast, EfficientGov.com Editor & Publisher, Barry Greenfield will walk you through the key steps necessary to initiate the addition of corporate sponsorship revenue to your budget. Timely information and municipal leadership regarding how to make government more efficient at the local level.